I’m sure a lot of you find the print on my top familiar (because you, my dear readers, have eagle eyes). It’s because it’s the same as the print of my dress here. I loved it too much I just had to get the blouse version as well! I actually find this top quite versatile–perfect for both work and play. Which reminds me, a lot of you have been requesting for more corporate wear style posts and since this clearly isn’t one, I’ll just give you a few tips on how to make it more business-appropriate. Just change the shorts to pants or a midi skirt. Piece of cake! If your boss is no grump, then I’m sure he or she would appreciate the happy vibes this outfit brings. But if he/she is a grump, you can still wear this blouse to work by toning it down with neutral colors. Match this blouse with cream suit! 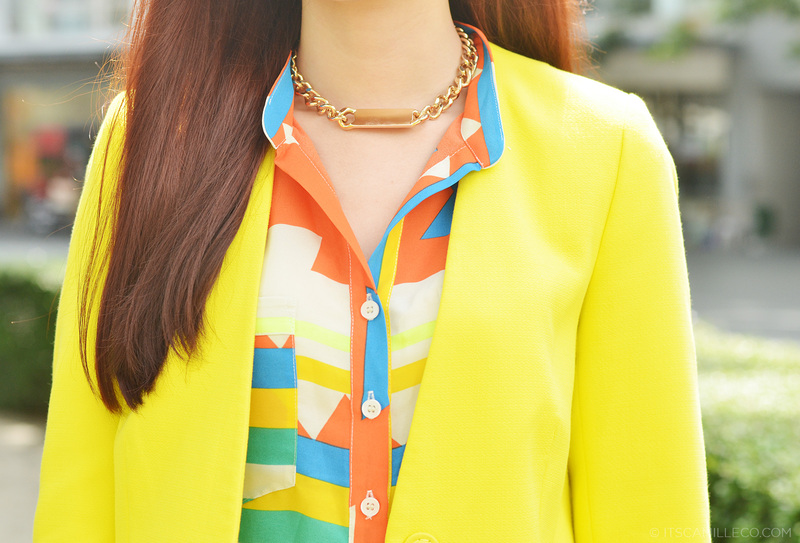 the color combination on that blouse is very versatile as it can be worn in summer, spring and fall, love it! i’m sure you’re tired of hearing this but, as always, you look fabulous in any outfit you wear. your eye for fashion is something that we can only dream of. Another favorite. I love it when you experiment on putting up vibrant colors! Hahaha! Thanks Izzy! We’re always so hyper! I love the colour combinations here, its so fun and cheerful! Awww great to know! Thank you Pat! .love that Celine ID Choker look for less..So chic..
Hello Camille! I need your help. Where can I buy a white dress like aGreek goddess outfit ? I need your quick reply. when you feel to be colorful and happy you usually wear yellow and it suits you well :) btw the quality of the photo here is awesome what dlsr do you use? I forever love your style and beautiful face! :) If I may ask, what facial wash and moisturizer do use? Your outfit today screams color and happiness! I think so too! Thanks Frances! We love it too! haha! Ewan ko na lang kung masagasaan ka pa or mabangga ng sino man when strolling around. Early Warning Device ang peg ng pagka-bright ng outfit mo eh! LOVE the 4th photo! You look so tall! Hahaha! I have to take precautions you know :) Thanks Tasha! Crazy about your Zara heels ! Hi Ate camille! :) Love the heels ♥ Just wanna ask, where do you usually shop online? I mean, what website, blog, etc.,? i’m in love with this outfit, the mix of colors is so cute! your outfits are totally chic and wearable that’s why i’m a superfan of yours. i’m so excited to see your next posts! Gad to hear that! :) Thanks Anne! It’s so positive looking. :) and so bright too. Naks naman! Nambola pa! Haha! Thanks Ren! 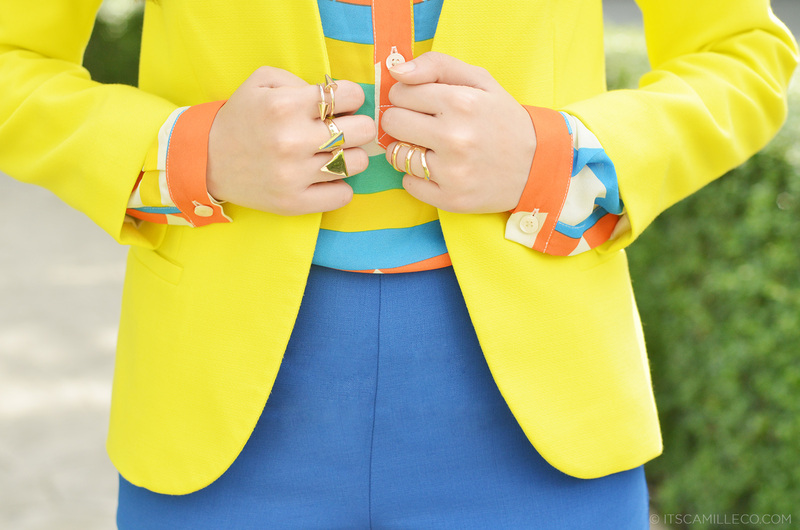 Those Zara heels and blazer look so yummy with their bright colors @. @ Gives me Summer-vibes even amidst the rain these days :)) It took me a second to realize that the blazer’s actually neon-y, lolz. Super cute!